The School was established in year 2003 under the guidelines of S.N Memorial Educational Society as S.N Memorial Public School which is a unique co-educational, English medium school for children right from Play Group onwards located in calm, pleasant and peaceful setting surrounded by dense forests of "Saal Wood" trees. The School is a boon for the meritorious and blessing for the intelligent under achievers. To provide quality education to Primary and Secondary level Children with affordable fee structure particularly in rural areas. To spread education, self reliance and self esteem to young once including those who have been deprived of it with Special emphasis on girl child education. To impart kind of education that gives a broad vision of life and creates a sense of belongingness with the whole world. To inculcate good habits, civic sense and discipline among the children this makes them cultured and civilized. To continuously work towards giving science stream education up to 10+2 level in the area. "EXCELLENCE EVERYDAY" through Self Motivation. The learning philosophy aims towards student's emotional, social, psychological and physical development as well as their cognitive growth. It is a broad based strategy where learning extends from the confines of the classroom to outdoor and co-curricular activities, ranging from individual to group activities. The focus of learning is to make the students self-reliant and confident to face the challenge of life. The teaching and learning models deploys several methodologies, SNM deals with the 5E's of Education i.e., Engage, Explore, Explain, Elaborate and Evaluate. The co-curricular activities like debates, recitation, essay writing, quiz, dramatics, science and art exhibitions allows the children explore and sharpen their skills. 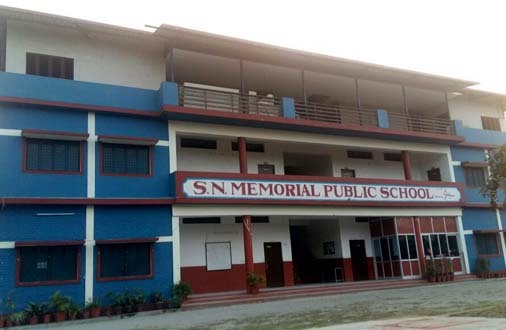 The School was established in year 2003 under the guidelines of S.N Memorial Educational Society as S.N Memorial Public School which is a unique co-educational, English medium school for children right from Play Group onwards located in calm. Developed By: World IT Dimensional Solutions.